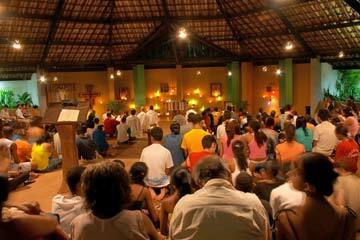 The history of Taizé in Latin America is already a long one. It began in November 1958. Brother Roger was in Rome for the beginning of Pope John XXIII’s ministry, and there he met one of the great Latin American bishops, Manuel Larrain, the bishop of Talca, Chile. That was the start of a deep friendship. Through this contact Brother Roger discovered the vast problems of all kinds which Latin America was going through. In 1962, Brother Roger learned that Bishop Larrain was currently implementing an intention about which he had spoken to him in Rome: to give away lands owned by his diocese in order to create a farming cooperative. Brother Roger took up a collection from Taizé to support this project. In October 1962, the Second Vatican Council began in Rome. Brother Roger met Bishop Larrain again. The bishop informed him that other Latin American bishops had the same intention as he did. One of them was the Chilean Cardinal Silva Henriquez, archbishop of Santiago: "We have land, we have poor people, but we do not have the means to launch farming cooperatives, which would have to receive subventions at first, but could then become independent." In 1963, at the request of Bishop Larrain, Brother Roger set up a solidarity fund in Europe to "come to the aid of initiatives taken by the sons of the South American continent, to give new hope in life to women and men who had lost it." This fund was called Operation Hope. Twelve concrete projects of farming cooperatives or agricultural training institutes in several countries of Latin America were fixed as goals, which would then multiply over the years. In 1964, Bishop Larrain suggested to Brother Roger that he add a second component to the solidarity fund: not only to take part in the promotion of the poorest, but also in their spiritual advancement. He emphasized the lack of New Testaments. Taizé would then send one million copies of the New Testament to Latin America in a new translation prepared by an ecumenical group of experts, the first one that took into account the specific idioms of Latin America. That New Testament was completed in 1968, and was sent to all the bishops of the continent, according to the number of inhabitants. New Testaments were also sent to the Protestant Churches, in proportion to the number of their baptized members. A note suggested that each reader read the New Testament to ten other people. The following year, a similar edition of the New Testament was prepared in Portuguese, and 500,000 copies were distributed under the same conditions in Brazil. Since the 1950s, brothers of the community have been sent in small groups to live among the poorest. At the end of the Council, the question arose: should there be such a fraternity in Latin America? Because of links with Bishop Larrain and other Chilean bishops, Chile seemed to be the best place for this. Several brothers got ready to go. A month before their departure for Chile, the Benedictine abbot of Olinda, Brazil, stopped by at Taizé. He asked Brother Roger, on behalf of the bishop of Recife, Dom Helder Camara, to send brothers to live there. Brazil was chosen. Beginning in 1966, the brothers lived with some young Benedictine monks near the monastery of Olinda. Later on the brothers moved to Vitoria, further south, where they lived from 1972 to 1978. In 1978, they went back north again and settled in Alagoinhas, in the State of Bahia. They share the lives and problems of a poor neighborhood, taking care of children, supporting the creation of a school for disabled children, welcoming people for retreats and meetings. In August 1968, Brother Roger was invited by Pope Paul VI to go with him in the papal plane to Bogota, Colombia. Another brother accompanied him and remained in Colombia for the General Conference of CELAM in Medellin, which he attended as an observer. During his stay in Bogota, Brother Roger lived in a favela. In January 1975, after taking part in the youth meeting in Guadalajara, Brother Roger went to Chile with two other brothers, one and a half years after the military takeover. Again he stayed in a poor neighborhood. 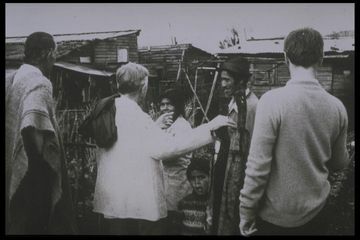 He returned to Chile with brothers and young people in November-December 1979, and went to live in Temuco, in a hut among the Mapuche Indians. There he wrote The Itinerary of a Pilgrim. He spent Christmas night in a women’s prison in Santiago. In February 1979, Brother Roger was invited as an observer to the General Conference of Latin-American bishops at Puebla, Mexico. He went with two other brothers. In November-December 1983, he went for the last time to Latin America with some brothers, stopping in Haiti and the Dominican Republic. He wrote the Letter from Haiti there. The Council of Youth was launched in 1970 in Taizé. Beginning in 1973, young people began to travel through Latin America and organized meetings in Mexico, Argentina, Peru, Colombia, Paraguay, Bolivia and Brazil. The most important of these meetings took place in December 1974 in Guadalajara, Mexico, in the presence of Brother Roger. This was the first Taizé meeting hosted by families, in a neighborhood, and it would provide the blueprint for future gatherings, in Europe and on other continents. These meetings would continue until the late 1970s. The Council of Youth ceased to exist in 1979 and was replaced by a "pilgrimage of trust on earth." In those years there was a long hiatus regarding meetings in Latin America; they began again in Brazil in 1997: the brothers from Alagoinhas begin to organize an annual meeting across the country. In October 1998, two brothers took part in a young adult Latin American meeting in Chile. They led prayers in the church of San Francisco in Santiago. They also participated in the Latin American Congress led by CELAM in the town of Punta de Tralca. Then, several young adult meetings were held between 1999 and 2005 in Mexico as stages in the pilgrimage of trust, and in Central America in 2006. 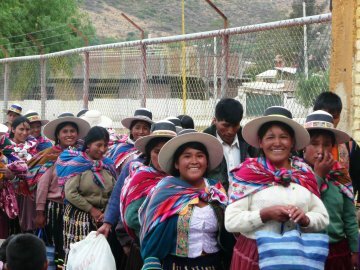 At the invitation of the bishop of El Alto, Bolivia, the brothers prepared a meeting of young people in his diocese in May 2004. Then, after visits to Bolivia and exchanges with the bishops, the decision was made to hold an international meeting of young people in Cochabamba in October 2007. Prepared for months with parishes and families of the city and its environs, this event brought together 7000 participants from different parts of Bolivia, from all the countries of Latin American and from several European countries. Brother Alois, Brother Roger’s successor as prior of Taizé, wrote a Letter from Cochabamba. Here, because of the presence of 300 young Chileans, the idea arose of holding a second international meeting in Latin America three years later in Santiago. In the late 1980s a regular exchange was set up between Taizé and Latin American youth. At first, young Chileans, Argentinians and Brazilians came to visit the hill to participate in the youth meetings for a period of three months. Today they come to Taizé from almost everywhere on the continent. The richness of life together, regularity in prayer and the discovery of the universality of the Church remain for them the highest values and enable them, back home, to renew their commitment in the Church and society.